Carriage House Wedding Photos are like images from a dream. The Carriage House, located in Galloway, New Jersey, has the perfect balance of glamour and charm. The enchanting qualities of this venue have made it one of the top choices for couples on the East Coast. Carriage House Wedding Photos showcase the location’s three elegant ballrooms -- the Savannah Grand Ballroom, The Magnolia and the Azalea. Each room gives guests a sense of Southern style and romance. The Carriage House brings the allure of Georgia to New Jersey and appeals to couples who want to feel that they have traveled without going any great distance. This image was taken at a wedding held in the Savannah Grand Ballroom. The ballroom includes a number of balconies, giving the space an air of grandeur. The Mezzanine Balcony in this ballroom offers a dramatic setting, with a space above the dance floor that may be used for the couple’s table as a place that is separate from the rest of the party, or that could be used as a space for a band. In the wedding scene pictured, the bride and groom chose to sit at a sweetheart table below the Mezzanine Balcony with the band staged above them. The band members stand on the balcony, jamming above the dance floor. The bride sits alone beneath them, raising her glass to friends and family and her new husband. 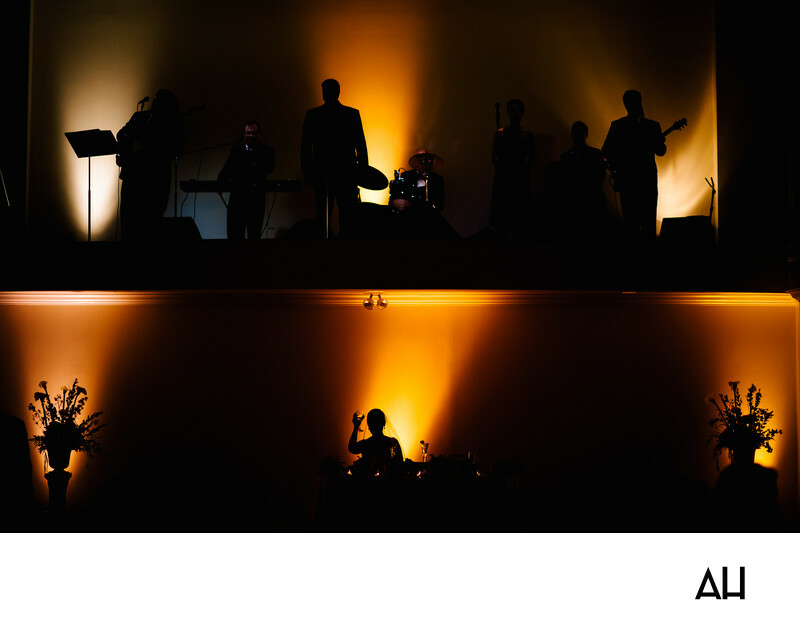 The lighting of the image makes for a dramatic effect, and the bride and band are seen only by their silhouettes. It is an image that highlights the magic of a beautiful evening.